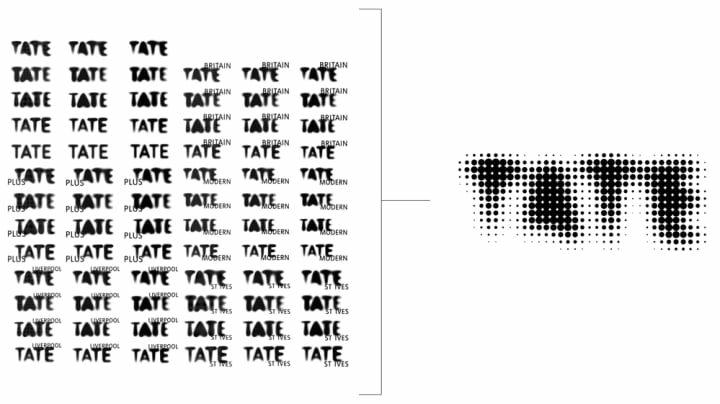 Previous variations of Tate’s logo, versus the singular version that replaced it in 2016. On the occasion of the 100th anniversary of its crane symbol, Lufthansa undertook the subtlest of brand refinements. Alongside a tweak to this symbol and review of its type system, emphasis would now be given to a darker and more elegant blue, with its distinctive yellow demoted to that of a more functional accent. Stockholm Design Lab tweaked Ericsson’s ‘econ’ icon to the nth degree — 18.435° to be precise — so that it would align smoothly with the pixel grid and appear sharper on screen. The change was accompanied by the introduction of a new brand typeface Hilda, also optimised for digital environments. Pentagram’s identity refresh for American Express again saw practically indistinguishable logo tweaks, but they also introduced a shorthand version to be used in situations where space is at a premium. For us to propose getting rid of the identity system entirely would be irresponsible and a selfish act as designers. Instead, we built on the existing brand equity, refreshed and strengthened what was working well. Possibly inappropriate, undoubtedly nonconformist and certifiably bonkers, part of me wishes I could dream up something as loose and unrestrained. This project confirms my suspicion that objectively, good design is about a consistency of execution, and somewhere within the madness of this identity, there is an element of coherence. Similarly, maintaining a degree of consistency is the reason why many established and trusted organisations will choose to refine their identities rather than replace them.